Build your next website on the Markup Factory Hosted CMS and realize a new level of control and flexibility with your web content management system. Markup Factory is the revolutionary web publishing platform for today’s web designer. Together, designers and website managers can use Markup Factory to quickly produce and publish accessible, feature-rich websites. Easily publish and manage content on your website using a flexible collection of tools that work on a PC or a Mac. You can create pages, blog, online databases and edit them with a variety of configurable tools including a WYSIWIG editor or others. Use a Markdown editor to enforce strict adherence to web standards. 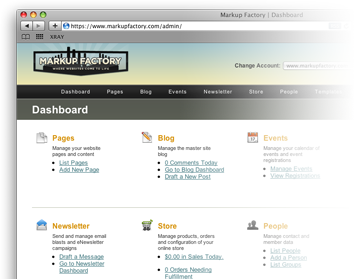 The Markup Factory Template Engine can support native XHTML / CSS code. Simply copy and paste, or use the Markup Factory scripting engine to add life to your template. You can find detailed information on how to use the Template Engine in our documentation. Optional add-ons include some very powerful utilities that convert your website into a powerful communications tool. Learn more about the Blog, Events Engine, Online Store, Newsletters, Membership Module, and Online Database. Learn about pricing and features included on our packages matrix page.